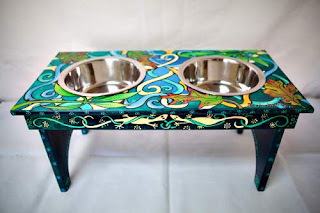 The following was passed along to me from our friend, Lillian Cox, who received a call from Stacy Steel, the Executive Director for the Foundation for Animal Care and Education (FACE) who has a charity auction under way with some one-of-a-kind feeding stands for your favorite dog or cat. FACE has done a lot of good over the years, so here's your chance to pitch in and give them a hand, and pick up one of several really creative works of art that just happen to be in the form of raised feeding stands. 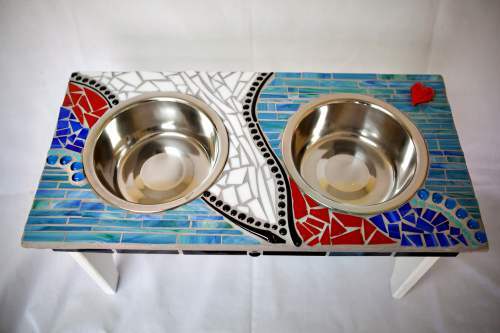 "Talented San Diego artists have created 60 unique masterpieces of art that will double as a pets’ feeding station. The stands come in a dizzying array of colors, textures, themes and media, as well as in two sizes. This designer dinnerware is a MUST HAVE for all pampered pooches and coddled kitties. They will make a fabulous one-of-a-kind Holiday gift for any dog or cat lover. The stands are currently available through an online auction which will run until the end of November. All proceeds from this fundraiser entitled Artists-4-Animals will benefit The Foundation for Animal Care and Education (FACE). To place a bid or make a direct purchase visit the FACE website at www.face4pets.org. The stands may also be viewed at the FACE Foundation office in Sorrento Valley and at local pet boutiques and veterinary hospitals (contact FACE for exact locations). The FACE Foundation is a non-profit 501(c)(3) organization that provides financial grants to save the lives of family pets facing “economic euthanasia”. 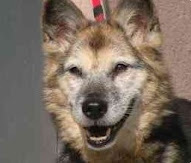 Financial assistance is given to pet owners in San Diego County who cannot afford their pets’ critical and life-saving veterinary care. Since its inception in 2006, FACE has given over $640,000 in life-saving grants. The Foundation relies on donations to save family pets, and Artists- 4 -Animals is just one of the many ways that FACE raises funds and partners with the community." For more information about this fundraiser, donating to or volunteering with FACE, please contact the Foundation at (858) 450-FACE (3223), or visit the website at www.face4pets.org. There are sizes and styles for all manner of dogs and cats. I highly recommend at least taking a look at the styles being offered, as well as journeying on over to FACE's site to learn more about what they're doing in the community to help pet owners take care of their pets during these trying economic times. I've got my bids in. One for myself and another as a gift. Well the auction is over and I was able to pick up a couple of feeders (one for Rusty and another as a gift). Great job folks at FACE!